David wants to hear from people who have connected the dots in their own unique way. He wants people to share their “blueprint to greatness.” What has contributed to their success AND their failures? It turns out David records 7, count them, 7 interviews a day and he really gets into it. Into your thinking and even your childhood. After an hour I was pretty tired and not sure how our discussion had gone.I felt challenged like I had never been before by an interviewer. But in listening and reflecting back on my life I was able to see my personal and professional growth with more clarity. On the Join Up Dots podcast David forced me to crystallize my thinking by not shooting me softball questions but by asking me some pretty tough ones. We learn so much from each other’s stories and I for one, am hooked on hearing the stories of others on Join Up Dots. Listen to a random one (there is such a diverse array of interviews to choose from). 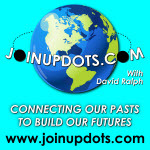 My friend Jessica Pettit’s and Simon T. Bailey’s are two “dots” broadcasts I recommend. So download, plug in and connect your own set of dots. A good step for the new year, right? Why it is so important to have quiet time in each morning, to reflect, get your thoughts together and tackle the day head-on. How now is the best time ever for introverts to make themselves heard amongst the madness of life, using social media at the right times to cut through the madness. How she wrote a book in 2005 even though she didn’t consider herself a writer. She had not found the mind-set to embrace her talents fully. How in her earlier years she believes that we was trying to prove herself to herself and the world in equal measures, and found it hard going to say the least. This entry was posted in Uncategorized on December 23, 2014 by Jennifer Kahnweiler.